Rehabilitation Units – This type of facility is a magnet for long-term rehabilitation care, with some patients in residence for months or even years. By visiting this type of facility, you and your dog are sure to establish close and long-term personal relationships. Nursing homes – Nursing homes were one of the first settings to accept the concept of pet therapy. The title “nursing home” has become somewhat dated in recent years. Corporate-owned facilities generally have come up with more marketable titles. Retirement Communities – The title says it all. When seniors decide to downsize to a retirement community, some of them may be confined to a wheelchair. Many of them will have fond memories of the pets they have owned, and they will want to talk about their pets. Hospice Care – Hospice care facilities often have dogs in residence, usually given free reign of the facility. If a hospice care facility in your area does not have a resident dog, this would be an excellent opportunity to start regular visits. Children’s Hospital – Kids and dogs; what a combination. Keep in mind that Children’s Hospitals are specialized facilities. Be sure to verify that your skills will mesh with their requirements. Public Library – Perhaps your local library is one of those who sponsor “reading-with-dogs” programs. This is likely to be a one-on-one therapy opportunity, where your energy and your dog’s energy are focused on just one young person. Here is an excellent opportunity for a handler who might not be up to the physical requirements of a visit to a 100-bed facility. General hospitals – Think for just a moment. The goal of many general hospitals seems to be to have their patients released in four or five days. Or less! If you have visited a patient in a general hospital, you are already aware of the tempo and the tension on many of the floors. This type of facility would not rank high on the list of possible therapy venues. Funeral homes – Yes; funeral homes. In her seven-year career, Ginger bonded with two elderly ladies who eventually passed away. With the approval of the funeral home director, each time, Ginger made a final therapy visit. 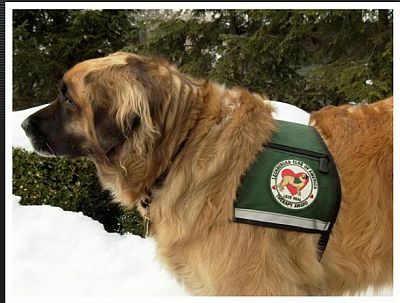 All of the family members of the deceased immediately recognized the therapy dog, even though they had never met her before. Both grandmas had kept their family members totally informed about their long-term pet therapy relationships.